The Small Container. While boiling up some hard boiled eggs for breakfast, I had a spark of a memory: I realized that as a kid I used to love eating soft boiled eggs, and hadn't had one in years. So, I checked the web for the proper timing. Sure enough, after 4 minutes of boiling, I had a candidate ready to eat. But then it hit me, as a kid we had these tiny plastic egg cups we used to mount the soft boiled egg in. And then you'd carefully tap, break and peal the top of the egg off of. 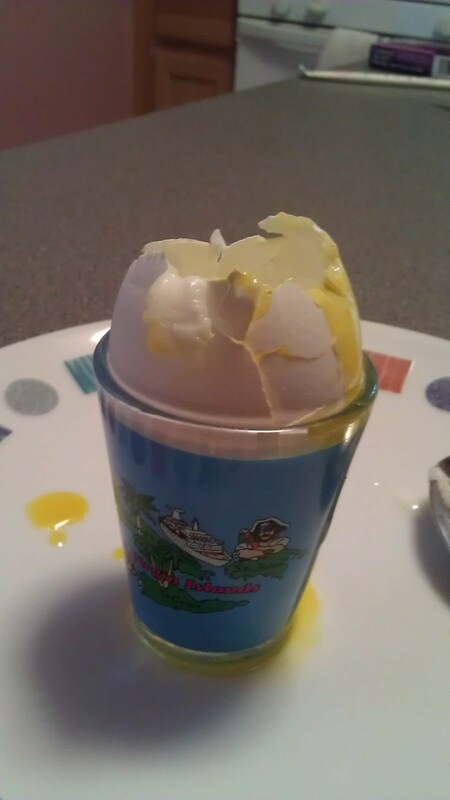 Of course, I didn't have one of those egg cup thingies. But, I did have a shot glass. It worked perfectly. The Big Container. 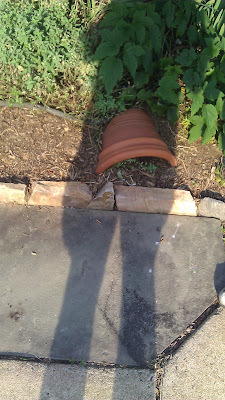 While on our way to the bus stop, our little guy and myself noticed this clever use of a broken planter. Wedged in just so, it looked perfect. What an excellent way to upcycle a container destined for the trash.